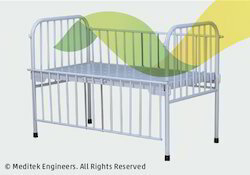 Special care needs to be taken while developing paediatric beds. The factors to be considered are safety of the kids, their comfort, the convenience of medical practitioners & paramedical staff and various high-end medical treatments these little ones undergo. 50mm X 25mm approx. 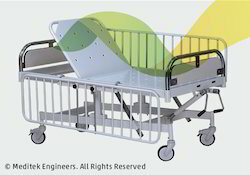 CRCA rectangular tube frame. Two section perforated CRCA sheet top. Two separate screws for backrest and trendelenburg & reverse trendelenburg position by individual SS folding handles. Four non-rusting 125 mm dia. Polyurethane Wheels 2 with brakes and 2 without brakes. Head and foot end bows with height 1060mm. Full length drop down side rails. Looking for 05-Child Care ?